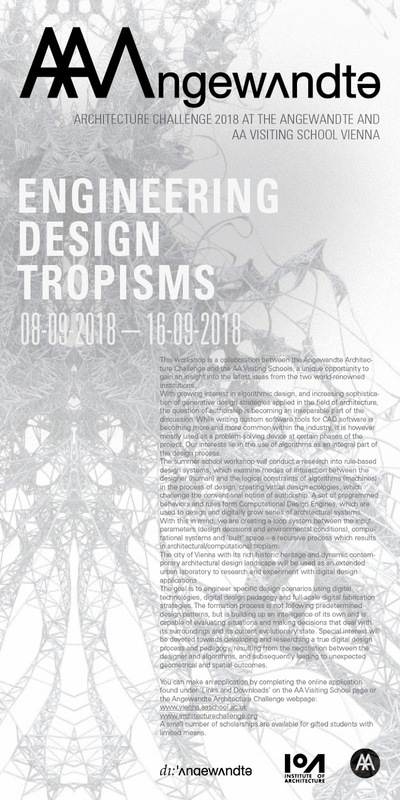 This workshop is a collaboration between the Angewandte Architecture Challenge and the AA Visiting Schools, a unique opportunity to gain an insight into the latest ideas taught at two world-renowned institutions. 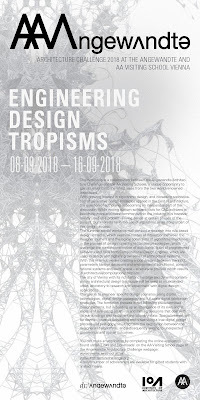 With growing interest in algorithmic design and increasing sophistication of generative design strategies applied in architecture, the question of authorship and integration of high-tech computational design tools in a streamlined design-to-fabrication process is becoming an inseparable part of the discussion. While writing custom software tools for CAD software is growing within the industry, it is mostly used as a problem-solving device at certain phases of the project. This workshop is interested in the use of algorithms as an integral part of the design process. The summer school workshop will conduct research into rule-based design systems, which examine modes of interaction between the designer (human) and the constraints of algorithms (machines). A set of programmed behaviors and rules form Computational Design Engines, which are used to design and digitally grow a series of architectural systems. The city of Vienna, with its rich historical heritage and dynamic contemporary architectural design landscape, will be used as an extended urban laboratory to research and experiment with digital design applications. The goal is to engineer specific design scenarios using digital technologies, digital design pedagogy and full-scale digital fabrication strategies, looking into the assembly of parts and automation of fabrication processes.